Hello BerryRipe readers! Lauren here. I love fitness and exercise and trying new group exercise classes. I will post articles about new fitness crazes going on and different exercise classes that I have tried. Also, I will post different exercises that will help you get the results you want! But the topic today is that horrible training plateau. Have you ever felt like you have reached a plateau with your workout and you’re no longer seeing any progress? Well don’t get discouraged because this happens to all of us. I have reached a plateau with my workout more then once. Are you ready to improve your workout like I am? The most important thing is to not give up! Break through your plateau and try something different, like TRX training! The class that really caught my attention was TRX suspension training. If you have no idea what TRX training is or have never taken a TRX class, then you’re in for a total body strengthening workout. TRX training began in the Navy SEALs and is a workout that uses your own bodyweight as resistance. TRX training will help develop strength, power, endurance, balance, flexibility, and core stability. No matter if you’re out of shape or a pro athlete, TRX will help you reach your goals. You are able to control the intensity of the exercise by changing your body position and angle to make it easier or more challenging. I was really impressed with this class! I definitely felt the effects of this class the next day. TRX training is really effective, and it will push your body to new limits. You can quit once you reach your plateau, keep the same workout and get no results, or BUST through the plateau and challenge your body! Plus TRX training is fun and different and you wont get bored with it. – The bands are tough and heavy duty and can hold up a lot of weight. But they are easily adjustable when shortening and lengthening the straps. – The suspension straps are lightweight and portable. – There are hundreds of exercises that can be done with it. 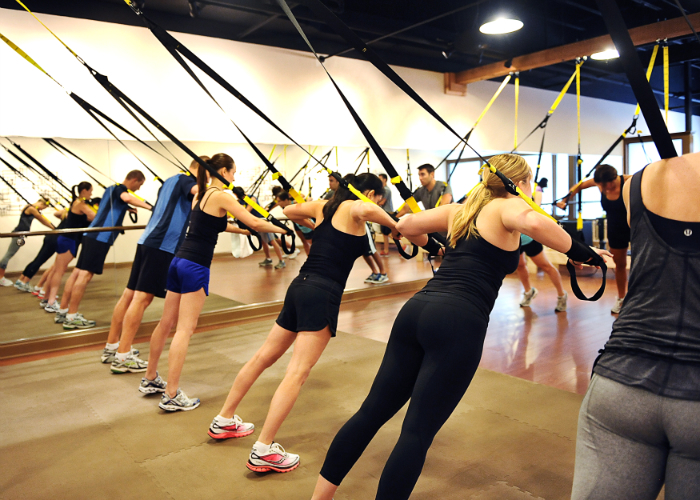 – The TRX straps are adjustable to make the exercise harder or easier. – The exercises work the entire body. It doesn’t target one muscle group. Using your body weight as resistance requires you to support your body weight with your core and other supporting muscles. – Strengthening and cardio exercises can be done on the TRX straps. Look for TRX training in gyms and fitness classes near you!